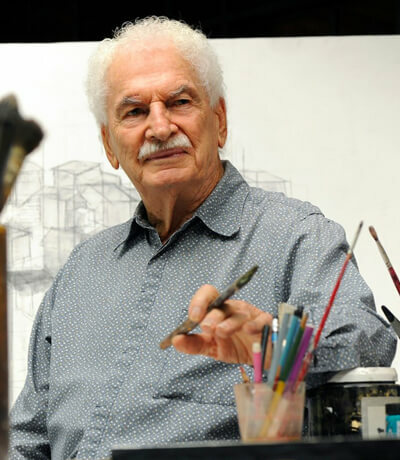 Felo Garcia is one of the main contributors of the emergence of abstract expressionism in the 1960’s in Costa Rica. He was the visible leaders of the “Group 8,” who had as their main objective to renew visual arts in Costa Rica. He is called the “advanced” as his nickname, for his outstanding contribution as an artists, architect, manager and teacher in the late 20th century. In 2008 he won the Magon National Prize for culture, the highest cultural award given by the national government to an artist. He graduated in 1956 in Architecture from Hammersmith School of Building and Arts, in London, England. He founded the New Vision Group for painting and sculpture in London in 1954. His has had individual and collective exhibitions around the world including: Costa Rica, Mexico, Honduras, Spain, Nicaragua, El Salvador, Panama, Brussels, Miami and Rome.